Ford got a lot of people rather excited when it announced the reintroduction of the Ranger to our market. Those people then got a bit less excited when they realized that the off-road pounding Raptor would not be part of the lineup. Sure, you can have an F-150 Raptor they said, but the smaller Ranger Raptor, that’s reserved for everybody else. Well, a number of aftermarket tuning specialists, including well-known Ford tuner, Galpin Auto Sports saw an opportunity and decided to Raptorize the standard Ranger with some choice off-roading components. 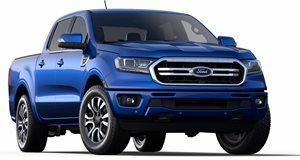 "The Ford Ranger is a legendary truck and with its reintroduction to the US market last year we thought that this was the perfect time to do something special. It was time to Galpinize,” said Beau Boeckmann, president of Galpin Motors. "Our team at Galpin Auto Sports took an already great truck and enhanced its capabilities to provide customers with additional off-road readiness, all with a dealership warranty.” The upgrades include a ProComp leveling kit complete with all-terrain tires and 17-inch wheels. 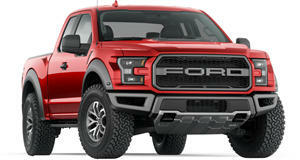 Visually the front benefits from a Ranger Raptor grille, Addictive Desert Design bumpers and a Rigid Industries Lightbar as well as some Ford-sourced fender flares. The end result is called the Ranger X, not exactly a carbon copy of the European Ranger Raptor (the blue one in these images) which is a good thing because we think it looks even better. The engine hasn’t been modified, so you still get the 270 horsepower, 310 lb-ft of torque 2.3-liter turbocharged inline-four under the hood. The Ranger X starts at $13,950, and while the EcoBoost motor is just fine for the standard Ranger, we think that all this mean machine needs to be the perfect Raptor antidote is a Galpin remap to liberate a few extra off-roading horses.